A Split Second of Paradise. Ed. Nicky Childs and Jeni Walwin. London: Rivers Oram Press, 1998. De Oliveira, Nicolas, Nicola Oxley, Michael Petry. Installation Art in the New Millennium. London: Thames and Hudson Ltd., 2003. Fried, Michael. “Art and Objecthood.” Chicago: University of Chicago Press, 1997. Kabakov, Ilya, Margarita Tupitsyn, Victor Tupitsyn, interview in Art Journal. Vol. 58, No. 4 (Winter, 1999) p. 62 – 73. 3. Tupitsyn, “About Installation.” 64. 4. Childs, Walwin, A Split Second of Paradise. 8. 5. Kabakov, “About Installation.” 62. 6. Kabakov, “About Installation.” 67. 7. Kabakov, “About Installation.” 72. 8. Oliveira, Oxley, Petry, Installation Art in the New Millenium. 106. 9. Oliveira, Oxley, Petry, Installation Art in the New Millenium. 167. 11. Childs, Walwin, A Split Second of Paradise. 21. 12. Kaprow, “The Legacy of Jackson Pollock.” 9. 13. Krauss, “Voyage on the North Sea.” 29. 14. Krauss, “Voyage on the North Sea.” 33. 15. Morris, “Voyage on the North Sea.” 223. 16. Fried, “Notes on Sculpture.” 20. This is a supplement to the existing glossary entry Installation. It will digress from the significance of installation in reference to its usage in the information age: the physical act of installing one media into another, (i.e. 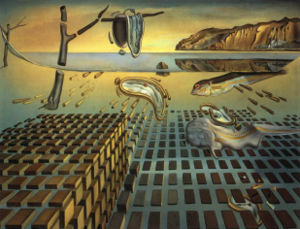 computer software that is installed into computer hardware), and focus on how the installation is viewed in the world of fine art. It is highly debated as to what the installation actually is: a genre, a style, or a medium in itself. To this day, it exists as an artistic controversy. Many argue that it cannot even be considered to be part of the art world entirely. We will explore this debate while explicating some of the basic principles behind installation art: the controversial characteristics that complicate its status as an art form. Installation first appeared in the Oxford English Dictionary in reference to art in 1969: Art. A large art work (esp. a sculpture) specially created or constructed for display within a gallery, museum, or other site; an exhibition of such works. However, the installation did not become a definitive art form until the 1990’s. When the installation was just developing, artists and critics alike were unsure of how to describe it. Names like “project art,” “temporary art,” and “Environment,” were used to describe what we now call installation artwork. Installation artist Ilya Kabakov concludes, “The installation medium continues to make people nervous today.”  Undoubtedly, the installation’s existence in the art world is not without controversy. This nervousness, those that champion the installation as a legitimate genre agree, can be attributed to one basic principle: The installation is an all-encompassing challenge to orthodox art. Drawing, painting, and sculpture are all complicated by the general characteristics behind installation artwork: site specificity, collage, three-dimensionality, and a demand for audience interaction. Installation artwork is generally a collage, a collection of mediums: painting, sculpture, video, drawing, photography and even performance. In fact, the genres of live art, performance art and installation are often grouped together. Rejecting the notions of orthodox artwork, the installation denies definition. It is a hodge-podge of objects, images, and sounds, refusing to be categorized into the standard artistic genres (painting, sculpture, drawing, for instance). Obviously this contributes to the controversy behind the role of the installation in the art world. That which defies categorization can be said to deny its position in the art world or even worse seeks to redefine and create entirely new categorizations, changing the art world entirely. The installation is mainly three-dimensional. This is of utmost importance considering that the installation is the creation of an environment: its subjection to space and time creates an isolated world. Although, it is a world in which natural laws and hegemony are denied. Fantasy reigns free. As installation artist, Ilya Kabakov describes the installation as a reorganization of space in which a collection of objects “attempts to encompass all the levels of the world…that describes everything that happens to it." Thus, the objects of the installation seek to invade upon our reality, abandoning the frame that normally qualifies an artwork, blurring the separation between art and life. Equally important is site specificity. Site specificity can be described as the importance of an installation artwork to be removed from a conventional frame that normally would envelope a painting. Thus, the definitive marker of artwork is abolished. The installation creates its own environment, it is frameless, uncontainable, ephemeral even (recall, one of its original names, “temporary art”), as the synthetic environment developed by the installation is a handmaiden to time, space, and each audience encounter: every experience is different. The installation may not move but it is ever-changing. Furthermore, it is wholly dependent on its surrounding space to successfully fulfill its true expression. This idea explains why installation artwork was originally called, “environment.” The status of the space is of utmost importance,  the elimination of the frame equates to the denouncement of conventional, orthodox artwork normally seen in a museum. And perhaps more importantly, site specificity establishes a new relationship between the artwork and the audience unheard of with a painting, drawing, photography, or sculpture. The nervousness that Kabakov attributes to the installation reaches entirely new levels: “Once inside the installation, [the viewer], sometimes experiences utter horror, complete incomprehension, discomfort and a desire to get out as soon as possible.”  Interestingly, those that encounter an installation often misrecognize its role as an artistic medium, leading to an inexplicable and jarring anxiety. This can be attributed to many reasons. One, the installation, as mentioned, strives to look as little like an easily recognized, conventional work of art: it is a miscellany of everyday objects obscurely organized in order to entice discomfort. Live performers are even used at times. This gives the installation an inherent theatricality, which many criticize as the antithesis to art. Though however horrified, the role of the audience is vital. It is explained that where the seventies and eighties were the society of the spectacle, the nineties, the age of the installation, mark the society of the interaction. 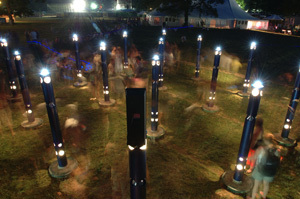 Thus, the full expression of the installation is only achieved when the audience engages the installation’s environment, to the extent that the body is to physically interact or respond with the piece, like artist Christopher Janney’s Sonic Garden, in which the touch of the spectator makes the work sing out in different tonalities, they create the melodies. The audience is actually installed into the work, is part of the environment. Of course this kinesthetic demand reverses the subject-object dichotomy and the spectatorship that we are familiar with in viewing a painting. In other words, “The authorship of the work passes from the artist to the viewer. “This, of course, changes the way that artwork is apprehended altogether, further tangling the installation’s place as an artistic genre. More abstract but just as important, there is the concept of universality. The installation desires to recreate an entire world, redefine space, engage the public sphere, and complicate the separation of art and life. The subsequent results of the basic characteristics of installation artwork carry inherent political undertones; the advent of the installation is thought to coincide with the social and artistic crises that defined the end of the twentieth century: America’s loss of the Vietnam War, the onset of feminism, the stock market boom of the eighties, and its subsequent collapse. These political upheavals served as the basis for the response to the formal aesthetic social structure; a refusal of the orthodox concept of visual representation, the cultivation of the illusion, the museum as the definitive institution for artwork. The installation is the current culmination of the movement away from conventional artwork. The installation seeks to break the hegemony surrounding the art world: moving art out of its frame, out of the museum, denying blank spectatorship—the installation seeks to redefine how we have historically viewed art. Of course, this does not come without serious contention. The installations claim to universality and its subsequent characteristics: site specificity, collage, and audience interaction are all points of heavy criticism. To expound upon these criticisms, it is first necessary to explore the different artistic influences that shaped the installation artwork. Roots in minimalism reveal a desire to deconstruct the illusion that historically served as the driving force behind the construction of an artwork. Thus, the relationship between the artwork and the observer was one deception. With painting used solely as a representative medium, the pipe was accepted to not just represent but to be, a pipe. Minimalism sought to break this illusion through exploring the materiality of the medium. No longer used to cultivate the illusion, the medium embodied the entire message. Magritte’s rejection of the representation of the pipe was taken to the next level—the symbol was completely obliterated in favor of arrangements of color and shape that exposed the materiality of the artwork. Think a Jackson Pollock over a Dali. Consequently, the viewer is forced to create an entirely different relationship to an artwork—and the status of the environment, in relation to the sensuous experience carries utmost importance. Instead of the blank spectatorship between the painting and its observer, we have the first inclinations towards the interactivity seen between an installation and its observer. What can be seen now, is the engagement of the observer into an artwork—a fusion of reality and life—the zenith being the installation. As installation artist Alan Kaprow states, “An odor of strawberries, a letter from a friend or a billboard selling Drano; three taps on a front door, a scratch, a sigh, or a voice lecturing endlessly, a blinding staccato flash, a bowler hat—all will become materials for this new concrete art.”  Live itself becomes art—there is no longer any separation, the installation brings us controversially closer to this. The idea of such a wide range of possible mediums becomes problematic when considering the convention of media specificity. Media specificity is the Greenbergian (Greenberg, the modern art critic) idea that the medium defines the work of art—hence, a painting is known by its flatness. Rosalind Krauss, in her essay, “Voyage of the North Sea,” shows that the technological advances of art, photography, film, and cinema, allowed for the justifiable reproduction of artwork that led to a denial of medium specificity, a stage which she calls the post-medium condition. In this state, as with the installation, the artwork defies the institution, the frame, the medium,  defies the hegemony that previously defined artwork, shaking the grounds of orthodoxy. Because the installation is a collage, it rejects medium specificity as well as rejecting medium the museum as the institution that defines art, complicating its relationship to the art world. As said, the installation is site specific and demands a kinesthetic involvement from the audience. This connects it to minimalist sculpture that relied, as sculptor Robert Morris states, on the “facts of space, light, and materials [which have] always functioned correctly and literally.”  Critic Michael Fried, attacks Minimalism because he believes that it is the meeting of art and theater, a combination which he views is entirely antithetical to art: “Art degenerates as it approaches theater.”  Because the installation depends of the experience of the viewer apprehending the work, and the installation is a staged and public event, it is inherently theatrical, and thus open to Fried’s critique. However with theater, the audience expects and acknowledges that there presence and interaction (clapping, laughing, sighing), are expected. They are aware of their important role. But with the installation, its theatricality is complicated when considering that the audience is demanded to interact, distracted by the work and thus engaged. Upon encountering an installation, the body is immediately part of the installation’s synthetic environment; he becomes victimized by the work. Secondly, when performers are part of an installation, they never engage the viewer, they are not actors—“The artist, as a rule, does not perform to the audience, rather it is this open-ended interaction with the potential of real-life situation that marks the viewer’s experience.”  The theatricality seen in the installation is problematic, theater when fused with art, Fried believes leads to its degeneration as the relationship between the work and the viewer is redefined to an interaction. At the same time, the installation adopts and transforms the medium of theater. Thus, we see the installation defying any categorization, further complicating its status as an art form, and art genre or an art style. The experience of the installation thus creates an interesting paradox. Although employing several techniques and ideals behind several artistic styles and genres, it twists and shapes their usages, redefining the hegemonic artistic roots from which they came. In this way, the installation seems to be a medium of artistic bricolage— the artists creating environments out of what they may. And although controversial, the installation is presently contributing to the progress and reshaping of today’s world of art.